A screensaver is a program (see What is a screensaver). Therefore, it contain an icon. This icon is used to display it in Windows Explorer or when you create a Shortcut to it in the Desktop for example. A standard icon is used but it's now possible to customize it. An icon is a graphic image, a small picture or object that represents a file, program, web page, or command. Icons help you execute commands, open programs or documents quickly. You can easily create your own icon file using Axialis IconWorkshop™ editor. To get more information on icons read this topic: What's an Icon? 3. 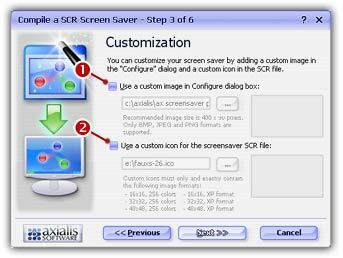 Click on the option Use a custom icon for the screensaver SCR file to activate it ( ). The edit fields below are automatically enabled. To learn how to create such an icon, see this topic: Create an Icon for your Screensaver using IconWorkshop™. 5. Once the pathname has been entered you see a preview of the icon image in the window on right. 6. If this is the right icon, click Next. If the icon has the correct format (see specs above), you can continue the compilation wizard. Finish the compilation and test it to see if the icon has been properly changed. REMARK: You can also customize the icon of the install EXE file if you have chosen to create an installation package. The procedure is similar and the icon should have the same specs. Click on the Advanced Customization button in Step 2 of the compilation wizard.